Retail / Commercial property between Knoxville and Lamar on busy Hwy 64. 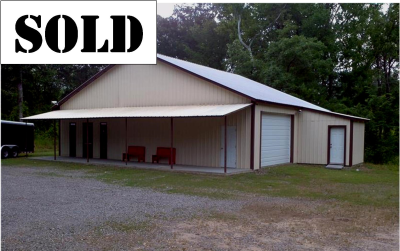 1,728 Sqft, metal bldg with 4.5 acres 1/2 mile off I-40 exit #64. Metal roof. Covered front patio/porch area. New water well provides an abundant supply of free water. 3 H/A window units. Possible uses may include a bait shop (1-2 miles from 3 access points on the Arkansas River), detail shop, auto body, mechanic, welder, plumbing supply, pawn shop, tobacco shop, beauty salon, you name it! Situated on 4.5 ACRES, mostly wooded with small seasonal creek and plenty of room for expansion. Built in 2005. Washer / dryer hook-ups, freezer, refrig hookups. Heavy duty concrete bridge spanning the seasonal creek branch that connects to an acre of the 4.5 acres. Real Estate property taxes approx $356 year. Hwy 64 frontage Traffic count map indicates 2,800 daily traffic count. 1/4 mile from I-40 on-ramp. "Trade Fixture" business sign on Hwy 64 included. Large level parking lot for 30 cars plus expansion for many more avail. Most commercial lenders require 20% down payment. I-40 to the Lamar exit #64 south about 1/2 mile. Property on the right. Steve Hula - Broker. NOTE: "Virtual Tour" below, select 720 or 1080p HD video quality and click on "Full Screen" box.